Most of my job is a lot like every other office job. My desk is in a cubicle, and I usually spend my days attending meetings and hopping between Word, Excel, and Microsoft Office. But, one of my favorite parts of my job is when I get to escape my desk and step behind our gray temporary walls to install the art in our exhibitions. Working on one of our newest exhibitions, Into the Deep, is one of my favorite projects so far – partially because the work in the exhibition presented some interesting challenges, and partially (ok, mostly) because it is a show I’ve been working on curating for almost two years. It was an amazing experience to finally meet artwork I had only seen in photos and to stand in 3D space that I had only been visualizing on paper. One of my curatorial goals was to give visitors a sense of the diverse number of ways you can use glass to make art. To fulfill this goal I looked for artwork that was as different as possible from the hand-sculpted vase or bowl many you probably have at home. This goal had a fun side-effect for me – several of the pieces in the exhibition presented our Curatorial team with some unique installation challenges. Blue Dome, by Seattle-based artist Kait Rhoads, is a giant (almost 9-foot tall) dome covered with individual blue glass scales. Visitors are encouraged to stand inside the dome and look up to feel like they are standing underwater. Kait Rhoads (American, born 1995). Blue Dome, 1995. 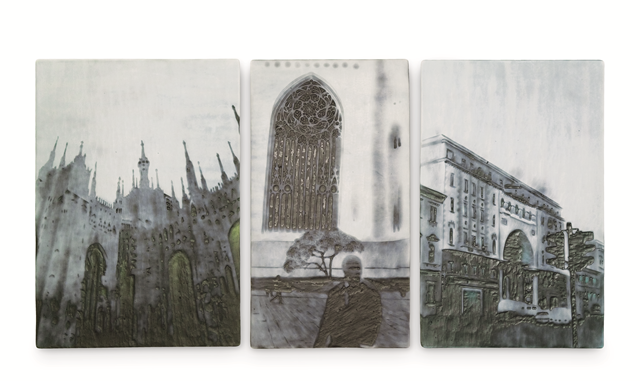 Single-strength plate glass, cut, drilled and fired with glass enamels; Courtesy of the artist. Fortunately, we didn’t have to attach each of the scales individually. The dome structure is made from a sturdy, steel frame. Kait Rhoads created a system where sheets of scales (attached individually to chicken wire) could be hung in sections across the metal frame. Artist Kait Rhoads (in center of dome) works with MOG art handler Elizabeth Mauro to connect a section of glass scales to the steel frame. On the left of the frame, you can see small tags that are used to mark the connection points for the sections of scales. Art installation is definitely a team effort. Here, Rebecca Engelhardt (MOG’s Exhibition/Collections Manager) and Kait Rhoads hold a section of scales on the outside of the dome, while art handler Elizabeth Mauro secures the section to the frame with wire. It took a team of four people almost six hours to install Blue Dome. Two Seas, by Shayna Leib is another piece which took a whole team to hang on the wall. Leib is an avid scuba diver, and each of the frames in this piece represent species of coral, sea grass, or anemone seen through the lens of her underwater camera. Each of the frames is teeming with life, made from fragile, individually-sculpted pieces of glass. Shayna Leib (Americna, born 1975). Two Seas, 2012. Glass, silver leaf and resin; Courtesy of the artist. Photo by Eric Tadsen. Each of the picture frames arrived carefully packed in individual boxes, which were shipped together in a large, padded wooden crate. We unpacked and cleaned each piece of glass, using Q-Tips, glass cleaner, and canned air to dust the crevices between each glass tentacle. A large table is set up in the galleries so each piece can be cleaned and prepared to hang on the wall. Parts of Two Seas were so detailed that we had to use Q-Tips to make sure all of the surfaces were sparkly and clean. Leib uses tweezers to set each piece of glass individually into resin, and in doing so creates the effect of the individually drifting tentacles of anemones. Often, artists will provide a template along with the artwork, so that we can hang a piece on the wall to their specifications. This is especially important for a piece like Two Seas, where the frames have to hang in a grid, but close enough together so that some of the glass tentacles from adjacent frames have the appearance of overlapping with each other. MOG art handler Elizabeth Mauro marks the template for on the wall. By hanging the template on the wall using a level, she is able to push a nail through the paper template, leaving a mark on the wall where each mount needs to be attached. Each of the framed glass pieces is attached to the wall using a french cleat. A french cleat is made from two pieces of wood, cut at a corresponding angle. One half of the cleat is attached to the wall, and the other to the top of the piece of artwork (see diagram below). The wood is cut at a steep angle, which act like two puzzle pieces, locking together to secure the artwork to the wall. The diagonal cut in a french cleat creates two puzzle pieces which lock together to secure the artwork on the wall. Elizabeth attaches the french cleat for piece #3 to the wall, and double-checks that it is level. The small pieces of blue tape are points marked from the template where the other French cleats will be attached. After all of the french cleats are attached to the wall, we can hang each of the frames. Here, Elizabeth is wearing gloves to keep the glass clean. Halfway finished! Two Seas is made of 13 framed glass compositions, which are each hung individually to the wall. Each frame is assigned a unique number, so we know which frame goes where, as well as which french cleat to use. Now complete, Two Seas is featured on the title wall of Into the Deep. These two pieces are just the tip of the iceberg (or should I say reef). I hope you can come down to Museum of Glass and dive on into the rest of the exhibition. Into the Deep is open through September 2017. Check out our calendar at http://museumofglass.org/event-calendar to learn more about events and activities related to the exhibition. Katie Buckingham is the Assistant Curator at Museum of Glass. She is an alumnus of Whitman College (BA) and University of Washington (MA). In her life outside of the Museum she is outside as much as possible, wearing skis as often as she does hiking boots. This entry was posted in Art, Artists, Curatorial, Exhibitions, Glass, Museums and tagged art museum, Curator, exhibition, glass art, Into the Deep, Kait Rhoads, Katie Buckingham, marine art, marine environment, Shayna Leib on October 17, 2016 by Museum of Glass. On September 14, Museum of Glass participated in #AskACurator for the second year. #AskACurator invites museums throughout the world to answer questions from the public on social media. This year, Into the Deep curator Katie Buckingham took over Museum of Glass’ Facebook, Twitter, and Instagram to field questions from curious online fans. Here are some of the questions she was asked and the answers she gave! Q: What temp does glass melt along the color spectrum, Curator? A: The melting point of a specific color of glass is specific to the brand of glass because it is specific to the exact chemical composition. Even clear glass melts at a variety of temperatures. The clear batch we use at MOG, called Spectrum 2.0, begins to soften at 1236*F and melts at 2200*F. Clear borosilicate glass (like Pyrex) glass melts at 3000*F because the chemical recipe includes the metal oxide boron trioxide. 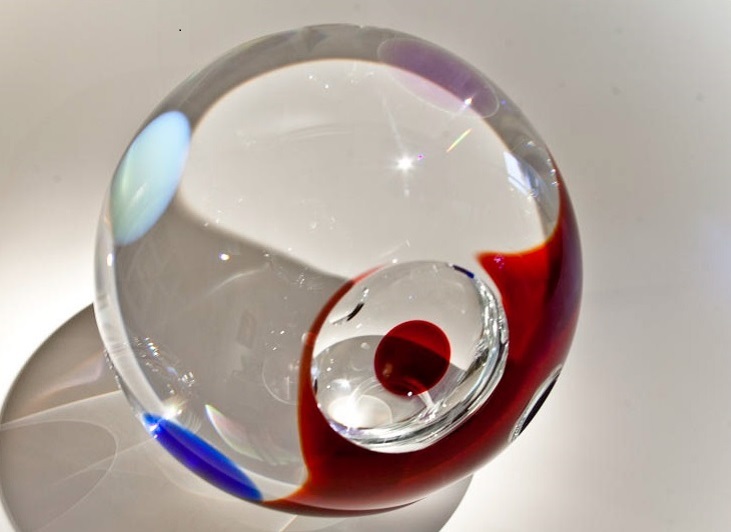 When glass artists purchase colors to use in their projects, each bar has a melting co-efficient (COE) that describes its specific melting temperature. Q: How can you tell if an exhibition is curated well or not? A: In my opinion, an exhibition should use the art/objects to tell a story. Q: How do you choose which wall colors to put behind exhibitions? Especially with clear or transparent glass. A: We have a fabulous Exhibition Designer who selects the wall color for our exhibits. She considers the mood of the show and also what makes the artwork look the best. Sometimes our artists have a specific color in mind, too. There are all sorts of tricks for clear glass – it depends on how much you want the piece to reflect the colors around it. A: If there was one artist you could be a curator for, past or present, who would that be and why? Q: Another hard question! Given that I’m surrounded by sea life lately, I would have loved to curate for Leopold or Rudolph Blaschka. They were a father-and-son team who created these amazing (and very scientifically accurate) glass models of sea life and plants. 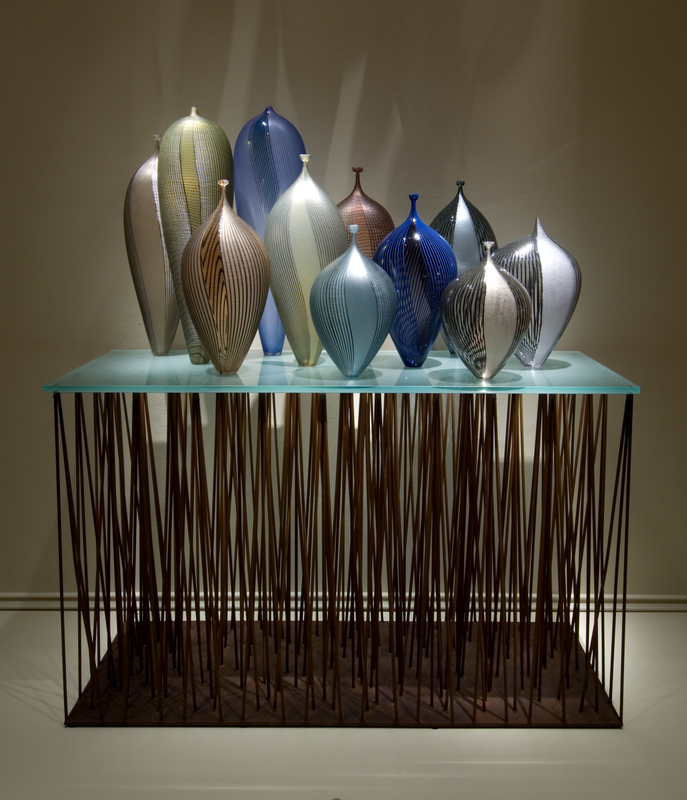 Our friends at Corning Museum of Glass have a great exhibit of their work. Check it out online: http://m.cmog.org/collection/exhibitions/blaschka. Q: What is the proper way to approach a gallery with your glass art? A: If you’re preparing a portfolio to present to a gallery, it’s helpful to include information about your work (an artist statement, biography and resume), as well as high-res images of your work with complete credit information. Q: Is there a certain piece or pieces you think defines the collection at MOG? A: It’s hard to choose just one! The first piece that comes in mind is Landscape by Beth Lipman and Ingalena Klennel. It’s monumental in scale (13 x 36 x 21 feet) and is made from over 400 pieces of glass. The artists collaborated on the piece during a series of residencies at MOG. It’s a beautiful piece, and a fantastic example of pushing the medium of glass to its limits by experimenting and collaborating. Beth Lipman (American, born 1971) and Ingalena Klenell (Swedish, born 1949). Landscape (detail), 2008-2010. 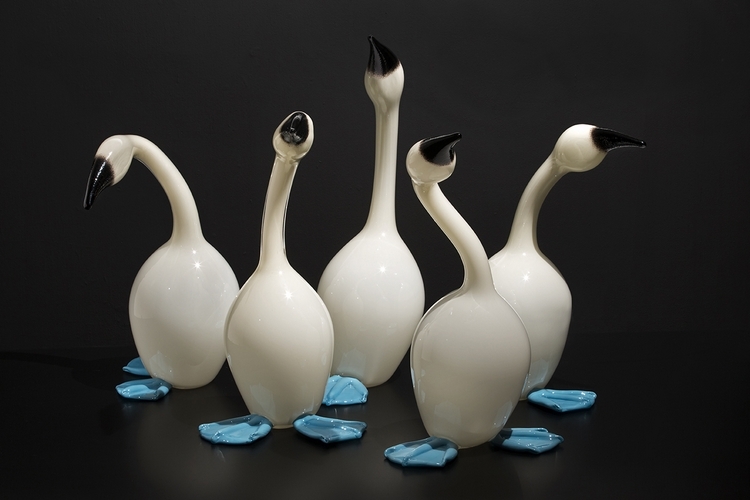 Kiln-formed glass; Collection of Museum of Glass, Tacoma, Washington, gift of the artists. Photo by Russell Johnson and Jeff Curtis. Q: How do you choose the pieces for a show like Into the Deep? Are they all pieces you already have in your collection? A: Great question! Into the Deep started with a “Big Idea” – kind of like a thesis statement in a written paper. Our Big Idea is: “Glass artists are inspired by the ocean. They use the unique properties of glass to capture the way light water with water, as well as the movements and textures of marine life.” We then for pieces that illustrated our Big Idea. Some of the artwork is part of MOG’s collection. 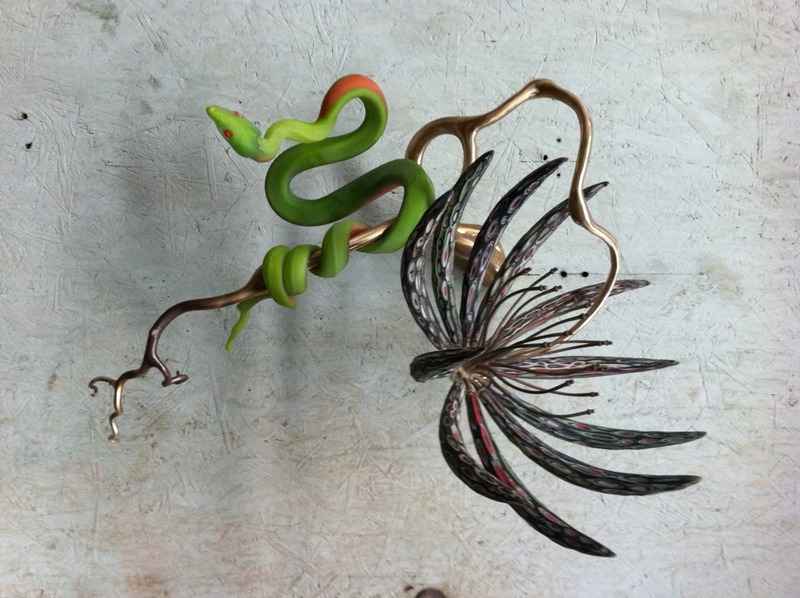 Other pieces, like Treasure-trove, were made in our Hot Shop. Kelly O’Dell (American, born 1973) and Raven Skyriver (American, born 1982); Treasure-trove, 2016; Blown and sculpted glass; 12 x 16 x 13 inches (30.5 x 40.6 x 33 cm); Courtesy of the artists; Photo by Kp Studios. Q: What’s your personal mission as a curator? A: I would love people to leave an exhibition excited about art and inspired to make something creative of their own. Plan a visit to see Into the Deep at Museum of Glass, open September 24, 2016, through September 2017. This entry was posted in Art, Exhibitions, Museums and tagged #AskACurator, Beth Lipman, Curator, Facebook, glass art, Ingalena Klenell, Instagram, Into the Deep, Katie Buckingham, Landscape, Leopold Blaschka, Museum of Glass, Rudolph Blaschka, Twitter on September 15, 2016 by Museum of Glass. This January at MOG, we’re inviting all of our visitors to #BeTheCurator for our newest crowd-curated exhibition, which opened January 16. Museum curators have a long tradition of being keepers of the past. Historically, they have been regarded as specialists responsible for the research and care of collections of objects. In the age of social media, the concept of curating has become an everyday occurrence. The Web is full of “curated” content that is selected, edited, and presented to represent specific concepts and ideas. Our interaction with Facebook, Pinterest, and countless other websites has made us all curators. Last year, we invited visitors to use their social media curation skills to create an exhibition. Visitors viewed a selection of artwork from MOG’s collections, both in the Museum and on Facebook, and voted on which objects to display in #BeTheCurator. Our visitors left thoughtful comments and insights about their selections, and I wanted to share some of their thoughts on a few pieces from the exhibition. In the age of the Internet, we each have the power to construct and curate information on a whole new level. By broadening our definition of “curator,” the Museum of Glass staff is excited to share the power to construct narrative, highlight artwork, and shape artistic development with our visitors! These objects, along with our other most “Liked” pieces, will be on display in #BeTheCurator now through October 23, 2016. We invite you to visit MOG and continue to be part of the Museum’s curatorial process. Each visitor gets to add their “Likes” to the pieces included in the exhibition! The artist who receives the most votes will be invited for a five-day Visiting Artist residency at Museum of Glass in 2017. Katie Phelps is the Curatorial Assistant/Visiting Artist Coordinator at Museum of Glass. She is an alumnus of Whitman College (BA) and University of Washington (MA). In her life outside of the Museum she is outside as much as possible, wearing skis as often as she does hiking boots. This entry was posted in Art, Artists, Exhibitions, Glass, Museums and tagged #BeTheCurator, April Surgent, Crowd-curated, Curator, David Huchthausen, Erich Woll, Lino Tagliapietra, Michael Sherrill, Museum of Glass, People's Choice on January 22, 2016 by Museum of Glass.